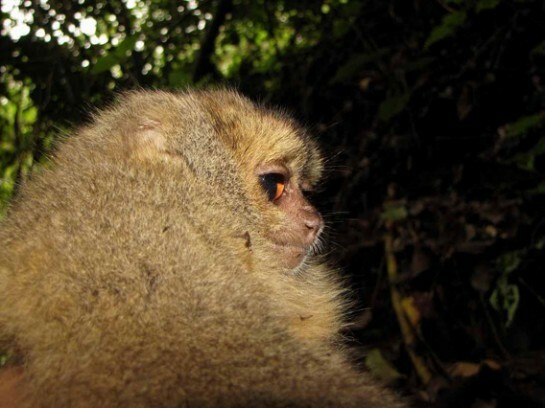 As conservation groups like WWF and others fight to protect a multitude of endangered species, it’s heartening to learn that new species are still being discovered —including previously unknown mammals like this cute creature below, which is a new kind of night monkey, though complete identification by biologists can often take several years. Every year scientists identify approximately 18,000 new species, but mammals are a minuscule segment of those, less than one half of one percent. So imagine the thrill when eight new mammals were found in a newly discovered, isolated tract of Peruvian cloud forest – it’s as if scientists have stumbled upon a whole new world. A team of Mexican and Peruvian biologists found this “new heaven of unknown biodiversity” on the eastern slope of the Peruvian Andes near the Ecuador border, according to a recently Spanish-language press release. The animals were located during the 2009-2011 expedition in the protected area of Tabaconas Namballe National Sanctuary, a 70,000-acre preserve whose cloud forests are also home to the endangered mountain tapir and spectacled bear. A region of intense biodiversity, the sanctuary harbors more than 90 mammals (with the new finds), 23 kinds of reptiles and 326 different bird species. In addition to the orange-eyed night monkey, other discoveries by the team include an unusually large common shrew opossum that’s classed as a marsupial; a large, dark, extremely long-quilled porcupine; an olingo (a tree-dwelling animal related to the raccoon); a small-eared shrew; four rodents; and three new amphibians. The wonder of the discovery is dampened a bit by the threatened state of the nature sanctuary: the land surrounding it has been badly damaged by deforestation, hunting and illegal mining, all of which are encroaching on the reserve itself. To read more on the new finds and see images of the discoveries, follow Jeremy Hance’s story at Mongabay.com. You can also travel to the Andean cloud forests (though not Tabaconas Namballe National Sanctuary itself), celebrated for their rich biodiversity, with Natural Habitat Adventures. Check out our South America adventures, including our Galapagos Kayaking & Hiking adventure that begins with two days in the bird-filled cloud forest above Quito.